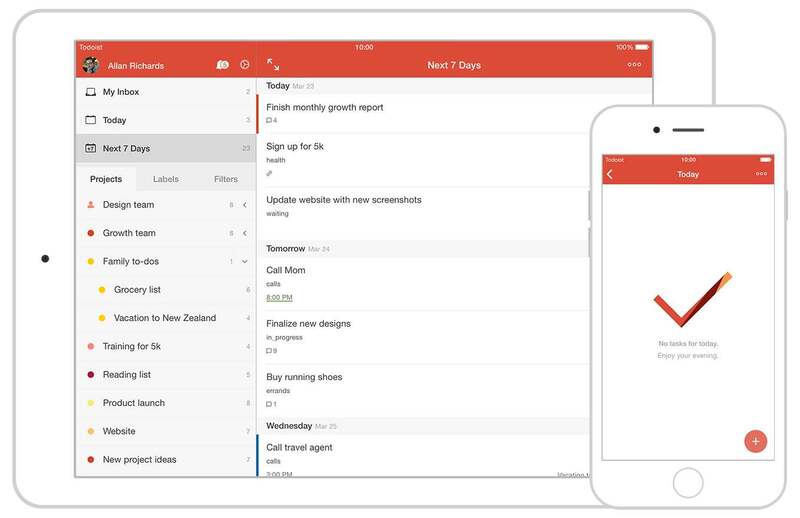 Todoist, a mobile app and a web service aimed at cloud-based task and project management for both personal and professional productivity, has received a thorough refresh on Tuesday. Available free in the App Store, the new Todoist 10 for the iPhone and iPad brings dozens of new features, including support for user interface themes, several new gestures to speed up common tasks, way more powerful natural language processing, new date options and many more enhancements. You’ll love the new gestures in Todoist 10. With the swift swipe of a finger, you can now complete and reschedule tasks on the go. To indent a new taks, swipe on top of the Quick Add interface. To indent a project, just long-swipe it. You can even use the pinch-zoom gesture to create a new task right between two existing tasks, similar to the Clear to-do app. And with multi-task editing, you can easily tap on multiple items and edit them all at once. As a matter of fact, this feature saves you time by making it easy to change all the dates in a project, move tasks their existing hierarchy to a new project, complete multiple tasks at the same time, change due dates, update priority status and more. The visually refreshed interface is now easier on the eyes than ever before. 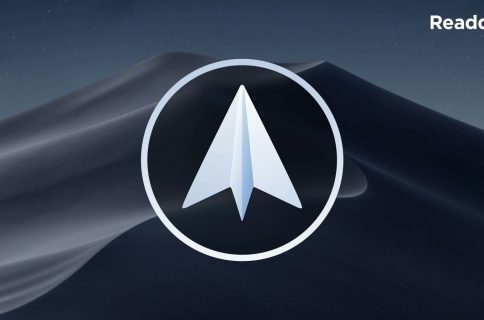 The new welcome and login screens — along with a redesigned notes menu and an updated left menu — provide the level of simplification that’s highly desirable in feature-rich productivity apps. And these are the new themes in Todoist 10. Aside from ten colorful themes and a redesigned user interface, the new intelligent date input in Todoist for the iPhone and iPad supports fourteen languages and more than three-hundred types of dates. There are two types of quick add, as well as start and end dates, expandable/collapsable list views and more. Check out the nicely done promo vid below. Adding tasks and setting dates and times is now easier because of the awesomely implemented Quick Add and intelligent input features. Though not quite as powerful as in Fantastical (exhibit A: no zone conversion), natural language processing in Todoist makes it easy to create complex tasks like “run two miles with Carrie every Thursday at 6am starting April 2 and ending October 12”. 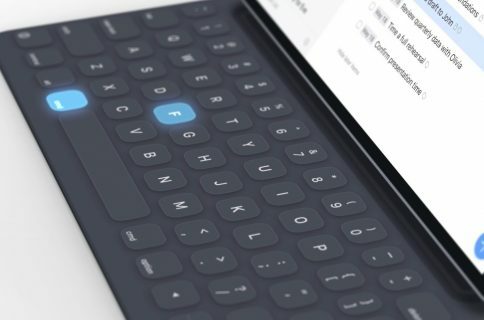 The Quick Add feature parses your input as you type, highlighting corresponding items when you type or dictate things like “every Friday at 8am” in the text field. For those wondering, Todoist has an Apple Watch in store. 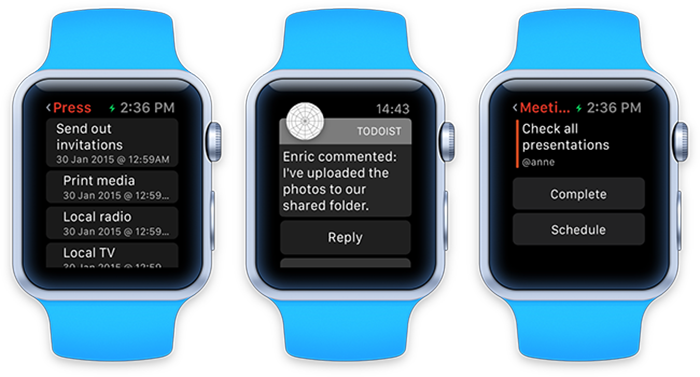 As we previously detailed, Todoist for Apple Watch will provide basic features and task management at a glance. You’ll be able to check out upcoming tasks and categories from your wrist, schedule tasks, mark items as completed and even reply to comments. 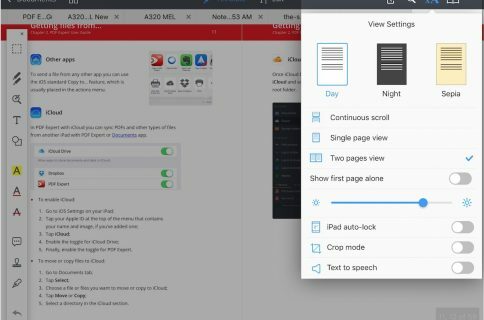 Additional Todoist 10 screenshots below courtesy of MacStories. The company hopes that these new features will make planning, organizing and executing everyone’s personal and professional projects easier than ever before. Capture all your ideas the moment they come to you with lightning-fast quick add. Complete and reschedule tasks on-the-go with the swipe of a finger. Edit multiple tasks at the same time. Type all the essentials like reminders, due dates, labels, and priorities right into the task name field. The intelligent in-line adding will recognize and parse out the information for you. Indent, reorder, and collapse tasks and projects to achieve the exact view you want. Add a new task right in the middle of your to-do list by simply pulling two tasks apart – a new task field will appear right between the two existing tasks. 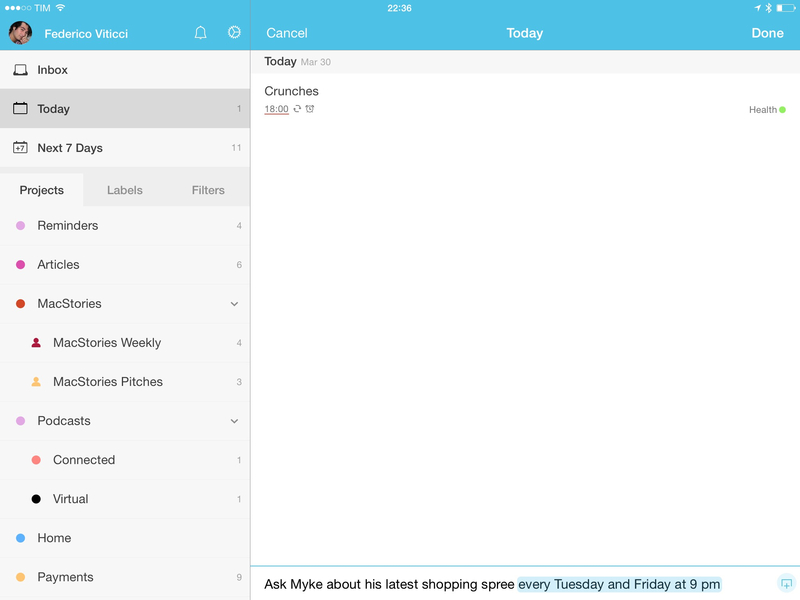 Make your to-do list your own with personalized color themes. Because we know a to-do list is a very personal thing. Remind yourself to “do 10 jumping jacks at 6am every other Tuesday starting March 1 and ending Feb 28”. Or create a task to “Order flowers for Mom 2 days before Mother’s Day”. That’s right, our completely revamped natural language date options now include start dates, end dates, “every other” dates, multiple times a day dates, common holidays, and many, many more. Schedule away. The team was kind enough to provide me with an early build of the software that I’ve been testing for the past couple of days. My early impressions are largely positive. Todoist represents a significant update in terms of new capabilities over the previous version, which wasn’t really short on features to begin with. I’m glad the team has addresses some major pain points while enriching existing productivity features with finer detail and deeper customization. 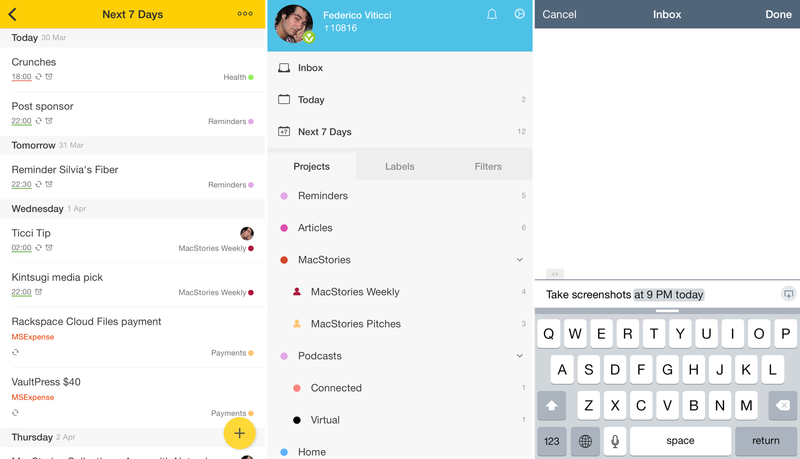 And with gesture support and user interface themes in tow, the app’s bound to attract new users who previously considered alternatives like Evernote, Sunrise Calendar, Wunderlist and similar cross-platform solutions. To learn more about Todoist 10, point your browser to the announcement blog post and read Federico Viticci’s detailed review over at MacStories. The app’s free so you stand nothing to lose taking it for a spin, really. Grab Todoist 10 at no cost in the App Store.